Love the assistance work during 5/3/1. Jim Wendler's 5/3/1 strength program is one of the more popular powerlifting and strength building programs out there. Wendler claims it to be "the simplest and most effective training system to increase raw strength." The 5/3/1 program focuses on the "four big lifts:" back squat, bench press, deadlift, and press. It is pretty easy to follow. Assuming you train 3-4 times/week, a training cycle is four weeks long, one day per lift plus supplemental exercises. In a nut shell, the first week you do 3 sets of 5 reps (3x5), second week: 3x3, and third week 1x5, 1x3, 1x1, where the last sets are all out effort sets, for max reps. The fourth week is a deload week where you do 3x5, at a light weight with no max reps on the last set. Norcal CrossFit at the Brethren Throwdown! Today I went down to Brethren CrossFit in Morgan Hill to cheer on our two NorCal CrossFit teams at the Brethren Throwdown! Taz, Pat, Hillary, and Garret were on one team, and Cheryl, Sally, Jaime, and Sal on the other team. Both teams did really, really great and were so inspirational to watch. The Brethren Throwdown was an Rx-only, four-person team competition. The theme of the competition was: "Workouts that are not STRENGTH related are Weak" and they definitely lived up to it! There were three WODs and top four teams advanced onto WOD 4. The winner of WOD 4 got to take home the grand prize of $1000 cash. With the start of the new year, new years resolutions and such, and participating in the Paleo/Primal Fuel Challenge, I have been extremely domesticated. Most of my (sparse) free time is spent on cooking, experimenting with different recipes, and coming up with new ones... more specifically recipes that don't take more than 45 minutes to cook, including prep time. 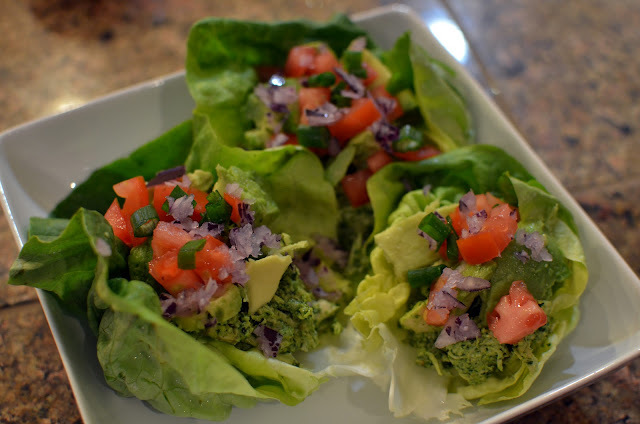 My chicken cilantro-pesto lettuce wraps is a twist on the popular beefy lettuce tacos recipe. I haven't shared a recipe in awhile, so I hope you enjoy this one! Catching a WOD at Hardass Fitness/CrossFit Hawaii was high on my must-do list while I was home for the holidays. The last time I was here, around Labor Day, they were just moving into their new location. Everything is set up now and the construction is done! I stopped by for the 9am class on Christmas Eve to do the final WOD from the 2011 CrossFit Games: The End. We had the option to row 20 calories or do a 400m run. Also since we did not have enough sleds, the sled pull at the end was replaced with 10 rope climbs.